Smoke bombs, tear gas, and pepper balls were used Tuesday night to disperse crowds of people defying a mandatory city-wide curfew in Baltimore. But authorities said the second night of the Baltimore riots showed demonstrators were relatively calm compared to Monday night's riots that led to more than 250 arrests. Police Commissioner Anthony Batts said at least 10 people were arrested Tuesday and told reporters during a midnight news conference he was "pleased" that the curfew, in effect from 10 p.m. to 5 a.m. until May 4, was more or less successful. The curfew is in fact working. Citizens are safe. The city is stable. The night did have tense moments, however, as several hundred people failed to clear the streets when the nighttime curfew went into effect at 10 p.m. Around 2,000 National Guard troops and more than 1,000 officers were posted on Baltimore's streets to enforce the curfew, according to the Associated Press. Authorities told crowds over bullhorns to go home. Baltimore police said on its Twitter account that a group of people at Pennsylvania Avenue and North Avenue were "aggressive" and "throwing items at police officers." Rioters hurled objects at police outfitted in riot gear. According to authorities, a fire also was set outside of a library at the intersection. Of the 10 arrests on Tuesday, seven were for violating the curfew. Two people were arrested for looting and another for disorderly conduct, Police Commissioner Batts said. In an attempt to disperse the crowds, police fired pepper pellets and smoke bombs and used armored police vehicles to help enforce the curfew. Baltimore police spokesman Capt. Eric Kowalczyk told reporters officers would use discretion when enforcing the curfew. Emergency services, those traveling to and from work, and media personnel were exempt. Our officers have discretion, which means if we see you and you explain you just got off of an airplane and you're headed home, they have the ability to exercise discretion and they don't have to arrest you. Tuesday night was a stark contrast to the previous day, which saw a peaceful funeral for Freddie Gray, a 25-year-old black man who died after sustaining a several spinal injury while in police custody earlier this month, quickly escalate. 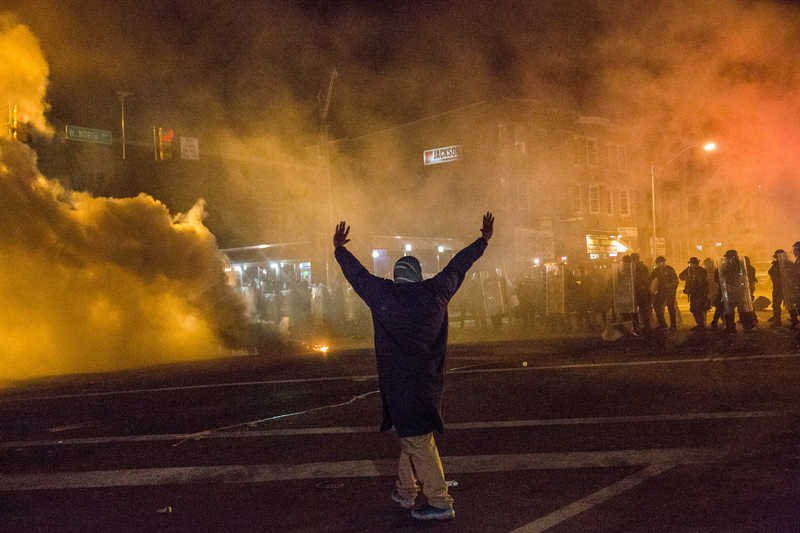 Rioting groups left buildings looted, 140 cars burned, and 20 officers injured. The unrest caused Gov. Larry Hogan to declare a state of emergency and call in the National Guard.